Patch and vulnerability management continues to be the first and last line of defense against existing and newest exploits. With the sophistication and sheer volume of exploits targeting major applications and operating systems, the speed of assessment and deployment of security patches across your complex IT infrastructure is key to mitigating risks and remediating vulnerabilities. 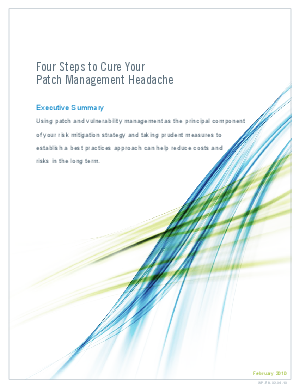 Read this paper to learn the four steps to cure your patch management headache.